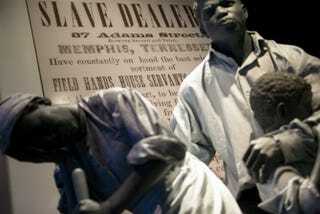 Models of slaves are seen in the “American Enterprise” exhibition at the Smithsonian’s American History Museum June 11, 2015, in Washington, D.C.
A Michigan YMCA has canceled its long-running Underground Railroad activity, deemed appropriate for students in fifth grade and up, after complaints from a black parent, who said that her child was “very disturbed” by the activity, the Washington Post reports. Students and teachers at the YMCA Storer Camps are meant to role-play as slaves in search of freedom, but one parent, Tiffany Birchett, told the Detroit News that her 10-year-old daughter was not very happy upon returning home from the camp in 2015. Birchett called the activity “racially insensitive” in an email to Pardee Elementary School Principal William J. Murph, describing her daughter’s experience. Another parent later voiced similar concerns about the activity. The ACLU of Michigan also took up the issue, writing a letter to YMCA leadership this month, voicing concerns about the activity. The YMCA of Great Toledo, which operates the camp, discontinued the activity immediately, the Post notes. “To its credit, the organization demonstrated wisdom and maturity by deciding to discontinue the activity,” Mark Fancher, staff attorney for the ACLU of Michigan’s Racial Justice Project, said in a release. “We respect and continue to respect the integrity and good work of the YMCA. “While we presume the ‘Underground Railroad’ program was the product of good intentions, it nevertheless was a disservice both to the memory of those who endured the horrors of slavery and to the child participants in the program who left the camp either traumatized or with the misperception that slavery was comparable to an overnight camp adventure,” Fancher added.